The Indian ringneck pied parakeet is a beautiful and rare bird whose feathers have a distinctive spotted appearance, hence the term ‘pied’. Each pied ringneck is pied differently as the distinctive pattern is inherited at the time of hatching and this pied pattern is retained throughout life. Although pied ringnecks can be found in the wild, these ringnecks are almost exclusively available through breeders who hatch the pied chicks in captivity in the US. The Indian ringneck pied parakeet is a mutation of the typical Indian parakeet with its green feathers, yellow underbelly and red beak. The pied parakeet has a recessive autosomal gene that is duplicated through careful breeding programs by avian culturalists. The resulting pied parakeets can have yellow tail feathers whilst sporting pied feathers in the upper body and wings. The Indian ringneck pied parakeet was originally developed in the US by Jaynee Salan who hails from California. She developed am extremely lovely blue pied parakeet. The simple recessive gene in the pied parakeet produces the remarkable mutation which is never alike in any two ringnecks. Male ringneck pied parakeet do not develop the special black ring around the neck which ringnecks have got their names for. 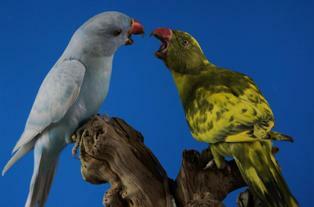 Among the colors that you are likely to find a pied parakeet is violet, sea green, bright yellow and cobalt blue. The Indian ringneck pied parakeet is being developed in the state of California in the USA. Other color mutations that are being tested on the ringneck are mauve, violet and cobalt blue. Mutating the color gene of the ringneck to mimic the range of colors found in budgerigars is very possible and this is an inspiration to avian breeders. The possible permutations of color for ringnecks are quite wide and can be exceedingly beautiful on the ringneck. Breeders continue to try inter-breeding various Indian ringnecks to produce an astonishing array of colors for feathers, even though developing and maintaining a mutated gene is a challenging task. The Indian ringneck pied parakeet is a lovely bird with distinctive patterns on its feathers. You can get a wide variety of colors of the pied parakeet which rivals the budgerigar in its complexity and vastness.